Healthy Single-Serving Red Velvet Microwave Cake… with a secret ingredient, shhhh!! And did I mention it’s totally healthy enough for breakfast? Oh, and how could I forget?! IT LITERALLY TAKES 5 MINUTES TO MAKE. This is how I satisfy my Red Velvet Cake cravings without having to bake an entire cake. This Healthy Single-Serving Red Velvet Microwave Cake is soft and fluffy and moist and sweet, with the perfect hint of cocoa and vanilla. Top it with cream cheese frosting and chocolate shavings and you’ve got yourself a real winner. You don’t have to choose between healthy or happy… you can have BOTH! This single-serving Red Velvet Microwave Cake is made with a secret ingredient, shhh! And did I mention it's totally healthy enough for breakfast? Rinse and gently scrub 1 medium beet, then wrap it in foil. Place the beet on a pan and bake for 1 hour, or until a fork pierces through the center with ease. Carefully unwrap the beet and let cool for 30 minutes. Spray 2 standard ramekins with cooking spray. In a medium-sized bowl, whisk together the almond milk, beet puree, ground flaxseed, vanilla extract, and butter flavor. Add in the sorghum flour, cocoa powder, baking powder, sweetener, and salt. Whisk until completely combined. Scoop the batter into the prepared ramekins and microwave them both for ~90 seconds, or until the surfaces spring back when tapped. Let cool. Serve with cream cheese frosting and shaved chocolate. Enjoy! YES. Only 190 calories and 4g of fat, plus 8g of filling fiber and 6g of protein. BOOM. I thought I would compare my cake’s nutrition label to the nutrition label of a typical Single-Serving Red Velvet Microwave Cake made with refined flour, white sugar, and lots of oil. And guys… it’s terrible. Click here to see the unhealthy version’s nutrition facts………………… MIND. BLOWN. Like, literally, my mind is blown to bits. I didn’t know it was even possible to fit 800 calories in such an eeny teeny cake! Well, apparently it is. I would much rather choose a cake with 190 natural calories over a cake with 800 artificial calories. Aaaand I’d also like to avoid the 57g of sugar (thats nearly 5 tablespoons!) in a single sitting. That amount of sugar is kind of scary. THANKFULLY, there’s a better option now with this Healthy Single-Serving Red Velvet Microwave Cake. How good does this bite of cake look??? Lemme just tell ya right now. It was damn delicious. PS: If you want a full-size Red Velvet Cake recipe, try this Healthy Red Velvet Cake or this Vegan Red Velvet Cake! This looks so great. 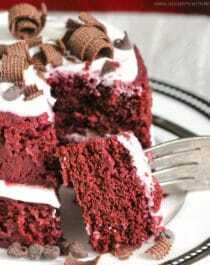 Red velvet is my favorite cake, hands down. There is a bakery near me that makes vegan red velvet cupcakes, but this looks way better! And I’m positive that yours is healthier too. I would love to see this soufflé style. Yum! Whoa. Eight-hundred calories (1000 with frosting?!) is A LOT! I always saw those mug cakes and thought how awesome, but then I’m like 2 Tb butter, 4 Tb sugar, oil….this isn’t going to end well! Yours looks like a version I can get on board with! And HOORAY for natural color! The whole bottle of nasty red dye for red velvet cake kills me. Bleck! Woah! What a great idea. I’m a huge fan of vegetable cakes and I’m sure that this one is delicious 🙂 I’m gonna bake it in a few days! I don’t know how I just discovered your site! Could other types of flour work? Such as whole wheat cake or AP? I haven’t tried it, but whole wheat pastry flour should replace the sorghum flour no problem. Hope you like the cake! It looks great. I love one serving cakes! Hi! I like this recipe so much! Can I use buckwheat flour like in the chocolate recipe? OMG NOMS! I love red velvet cake and hate sharing, so aka this cake was made for me! Could you use garbanzo bean or coconut flour in place of the sorghum? This recipe looks delicious!!! ??? sure about the amount of baking powder (I’ve made regular sized cake with a whole teaspoon)?